Whispers in the Loggia: In San Francisco, "Rebuild My House"
SVILUPPO: As the expected protests go, wire reports from the Bay indicate that some three dozen demonstrators gathered beyond the cathedral plaza to express opposition to Cordileone's leading role in defending the church's teaching on marriage. Inside St Mary's, the Mass itself – featuring a significant amount of Latin chant – proceeded without incident. Yet in a bizarre coda to what's already been anything but a typical installation week, following the liturgy a statement emerged from the Episcopal diocese of California in which its leader, Bishop Marc Andrus, claimed that he had been "detained" on his arrival at the cathedral, and left without being seated. As noted earlier, the assertion came three days after the Episcopal prelate issued a public "welcome" letter to Cordileone that chastised the new archbishop's stance on homosexuality, in addition to urging his own diocese to welcome any Catholics who would choose to defect amid their local church's controversial change of leadership. In a response to the Associated Press about the alleged incident, the San Francisco archdiocesan spokesman said that Andrus had arrived at the cathedral only after the ecumenical and interfaith guests – who, by custom, walk at the head of the procession, before the Catholic clergy – had begun their entrance into St Mary's, and that the Episcopal bishop was merely asked to wait until he could be seated with the group. "When [ushers] went to retrieve him," the wire said, Andrus "had already left." "We had no intention of excluding him at all," the spokesman, George Wesolek, told the AP. "If he felt like because of the wait that was insulting to him, we certainly will apologize." In an additional development of note, it emerged late Thursday that – a week ahead of his scheduled court-date – Cordileone had entered a guilty plea related to his August arrest for driving under the influence at a Monday hearing in his native San Diego, where the incident took place. 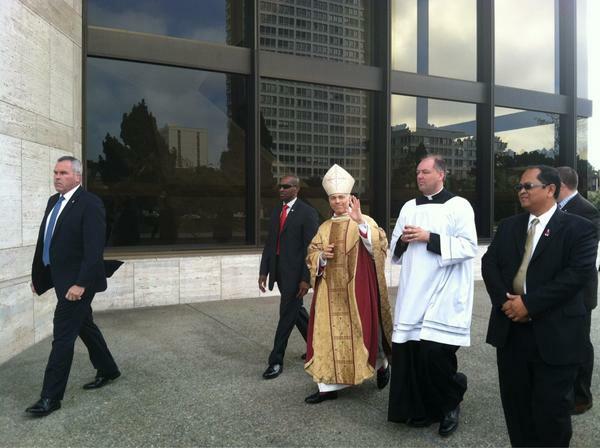 In light of the archbishop's clean record, the charge was reduced to reckless driving. As the case's resolution had not yet been entered into the court's computer system, a spokeswoman for the city attorney's office told San Francisco outlets that she "believed" the archbishop's sentence entailed three years of probation, a fine of $1,120 and attending programs for first-time offenders. Cordileone reportedly spent 11 hours in jail following his arrest, which came as he was stopped at a police checkpoint after a dinner with friends and his mother.